DETAILS: Luxury and privacy make this breathtaking WaterColor home the perfect place for your next 30A getaway. 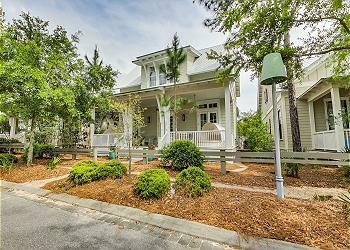 This home presents 5 bedrooms, 5.5 bathrooms, and wonderful accommodations for 14 guests. Neutral interiors create a soft and welcoming glow for guests arriving to this incredible home. The first floor features a spacious open floorplan between the kitchen, dining, and living areas. Guests will love relaxing in the cozy living room, which features coffered ceilings, two sofas, plush armchairs, and a large mounted flat-screen television. The nearby dining area offers seating for 8 guests, with additional seating at the breakfast bar. This home’s gourmet kitchen boasts premium stainless steel appliances, bright white custom cabinetry, and granite countertops. Also on the first floor is one of the home’s two master bedrooms. This guestroom offers a luxurious king bed and a private bathroom with a shower and separate soaking tub. The second floor offers a variety of guestroom accommodations. The first room features a queen bed and a private bathroom with a shower/tub combo. Two built-in twin-over-twin bunk beds and a private bathroom with a shower/tub combo create a perfect space for kids in the bunk room. The final bedroom on this level is a gorgeous master suite with a plush king bed and a private bathroom with a soaking tub and a shower. The carriage house offers a perfect setup for guests seeking a little more privacy. This space features a living area with a mounted flat-screen television and a queen sleeper sofa, a bedroom with a queen bed and a private bathroom with a shower/tub combo, and a kitchenette with a full-size refrigerator/freezer, a sink, and a microwave. Guests will love the home’s theater room, which boasts an oversized cozy sectional sofa and a large flat-screen television—a perfect place to enjoy a vacation movie night and snacks with loved ones! This home also features multiple screened porches, welcoming guests to enjoy the beautiful surroundings of idyllic WaterColor. Just across the street is Long Leaf Park, and WaterColor’s famous community pools. Your dream WaterColor getaway is just a few clicks away. 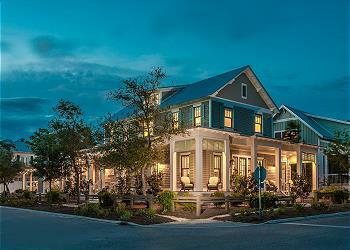 Book your stay at 22 Wiregrass Way by contacting 360 Blue today! This is a place our family always gravitates. It allows the children to be children and the adults have a chance to enjoy as well. We always feel relaxed after leaving here. It’s gives everyone a chance to have their own space as well as gathering for meals as a family. It’s the best of both worlds. We will be back. We are so delighted that you enjoyed your vacation with us in Watercolor! We agree that this home is perfect for everyone and gives everyone a chance to relax and have fun! We look forward to seeing you all again soon! Comfortable firm bed with super soft bed linens, clean, safe (secure door key code system), great gas stove, plenty of space, and my favorite - 2 large porch swings. Wonderful to have use of 2 pools, special beach access, use of bikes and tennis courts. Lovely week! This photo practically oozes relaxation! We are so glad that you could enjoy all of the wonderful aspects of the property, the private beach club is definitely a perk! We appreciate you choosing 360 Blue for your beach getaway. Come back and visit soon! What a fabulous home. Everything was so nice. We loved the front porch swings, such a nice place to sit, anytime of the day. Having bikes available was a nice addition, we rode everywhere, to the beach, afternoon treats, and dinner. We loved the bikes. What can I say about the beach other than spectacular. Wow, the water was lovely and the beach beyond words. Haven't been on too many beaches that squeaked when you walked. Such a beautiful photo! Thank you so much for the kind words. We are so happy that you had such a great stay in this amazing home. You really can't beat a good bike ride on 30A. We hope to have you all back soon! Watercolor is fabulous! 22 Wiregrass Way is a beautiful home with plenty of space for a large group. 360 Blue Properties made rental easy and helped when needed. Unfortunately, the cleanliness of the house left something to be desired. For the price, it should pass a white glove test. The housekeeping did not do a very good job of cleaning after the previous guests left. We took care of these things ourselves, we just were disappointed in the lack of detailed cleaning this house and its visitors deserved. There were also not enough towels or linens for the property which was unfortunate. Otherwise, we thoroughly enjoyed our stay. We loved the area and look forward to returning in the future!! We are so happy to hear that you enjoyed this home so much. We sincerely apologize for the cleaning issues that you had upon your arrival. We will be sure to address that with our housekeeping team so that this does not happen again. We look forward to having you back soon! This was our first visit to Watercolor and 360 was a wonderful resource! We loved everything about our stay, the house was terrific and the proximity to the beach and restaurants were a perfect bike ride. A great time was had by all! What a beautiful picture!! Thank you for staying with 360 Blue for your first visit to WaterColor! We're so happy you enjoyed the home and its great location. Come back soon! Great stay in 22 Wiregrass Way. We have stayed here for the past 7 or more years with extended family. The updates look really good. Our only complaint is that the fireplace has never worked. Great picture Wise Family! It is always a pleasure having you stay with us here in WaterColor. Thank you for the feedback. This home will be undergoing some major improvements within the next few months, including the fireplace! Not only have the owners decided to enlarge the living room for more seating, but they're adding a third floor as well! We hope to have you and your family back to see the finished product! Thank you again! Great house, great location, great vacation!!! What a cute picture! Thank you Roth Family!